Alibaba (BABA) may not have a meaningful retail presence in the U.S., but the Chinese e-commerce powerhouse is finding other channels to enter the American market. Alibaba’s film division is teaming up with media company STX Entertainment to bring a highly anticipated movie to U.S. theaters. Yahoo Finance has exclusively learned that California-based STX Entertainment will be distributing “Peppa Celebrates Chinese New Year” in time for the Lunar New Year. After the film’s trailer debuted earlier this month, it quickly lit up Chinese social media. The Mandarin hashtag #WhatisPeppa (#啥是佩奇#) was viewed more than 1.45 billion times on popular messaging platform Sina Weibo. 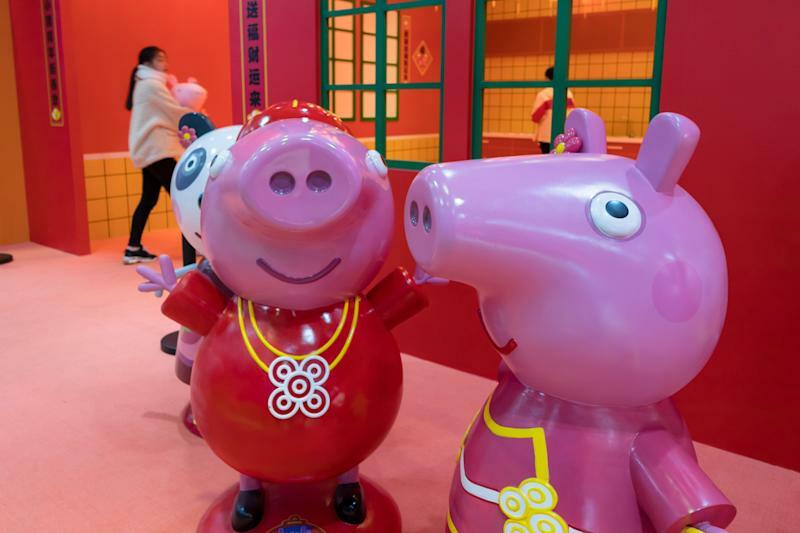 “I got a phone call from Alibaba a week and a half ago — shortly after the marketing materials for Peppa in China had gone super viral… And it was clear to us that the virality was extending far beyond. It was clearly also being seen and paid attention to the Mandarin-speaking population in the U.S. It was something you virtually couldn’t miss,” STXfilms chairman Adam Fogelson told Yahoo Finance. Stories rooted in Asian and Asian-American culture have been gaining immense mainstream popularity in the United States. Warner Brothers’ “Crazy Rich Asians” was a bonafide box office success, becoming the top-grossing romantic comedy in a decade. Pixar’s “Bao,” a short film about a dumpling that comes to life, is nominated for an Academy Award. Initially, Fogelson felt it would be “virtually impossible” to orchestrate a U.S. release within a few weeks, but he was ultimately convinced that he could “absolutely pull it off” after watching the film himself. It’s a completely global amalgamation, given “Peppa Pig” is a British cartoon that’s ubiquitous among American households with children. The film opens in China on February 5, the first day of Chinese New Year (and the first day of the Chinese zodiac Year of the Pig). STX will release the film on February 6 in 65 theaters across 32 U.S. markets with high concentrations of Chinese-American audiences like Los Angeles, New York, and San Francisco. It will be in primarily early showtimes to target children and family viewing, and it will be subtitled in English. Spanish language and Bollywood films have had successful runs in the U.S. But the target demographic for “Peppa Celebrates Chinese New Year” is still very narrow, with about 3.4 million Americans, or about 1% of the entire U.S. population, speaking Mandarin at home. Of course, a significant number of Americans speak Chinese as a second or third language. Still, given the short notice and niche potential reach, Fogelson said this collaboration isn’t as much for financial gain as it is about building upon STX’s relationship with Alibaba. “The profitability of this partnership in the United States is likely to be limited. But there’s no downside. This is not a financial rationale or justification. Historically speaking, the films that have been released in the Mandarin language in the United States gross from a couple hundred thousand to a few million dollars. But the primary purpose of this was to continue this relationship and for both of us to deepen our ties in working together,” he said. The idea to target Chinese speakers in the U.S is still a nascent one. And STX, just under five years old, has quickly become a heavy hitter in Hollywood, especially because of its understanding of China. Founded by film producer Robert Simonds and Bill McGlashan, a managing partner of private equity firm TPG, the company is backed by highly influential Chinese investors including Hony Capital and Tencent Holdings. PCCW, Southeast Asia’s largest internet and cable services provider, and Liberty Global, the world’s largest distribution platform, are also behind the company. STX Entertainment even had plans to go public on the Hong Kong Stock Exchange, but scrapped its IPO late last year. Fogelson, who served as Chairman of Universal Pictures prior to joining STX, said the company is well-positioned given Hollywood’s increasing appetite to grab the Chinese viewer. "We likely have more announced projects with Chinese companies than all other Hollywood studios combined. It's not because we are required to work with each other; we choose each other. The U.S. has successfully exported content to China for decades and now we’re seeing a big interest in China exporting its films. Alibaba coming to STX with this project is the beginning of that process. And it’s something we’re uniquely positioned to do given our deep experience working with all the giant partners in China,” he said. This can be an edge for STX as Chinese content creators pursue new markets, particularly amid a stagnant domestic economy, where growth has slowed to a 28-year low. “In these dynamic times, we can be an authentic bridge — both from a business and cultural standpoint because we have pre-established our desire to be great partners with Alibaba, Tencent and others. We have only seen the amount of conversation increase and we see it as a strategic advantage." Alibaba Pictures and STX currently have several projects they’re co-producing and co-financing, including a multifaceted Ugly Dolls collaboration, which includes an animated feature film, a TV series on Hulu, games, and dolls. They’re also co-producing sci-fi and live action films like “Steel Soldiers” and “Warriors” that draw on themes that resonate with both Chinese and American audiences. The news of this partnership comes a day after Alibaba posted revenue growth that was its slowest in three years.